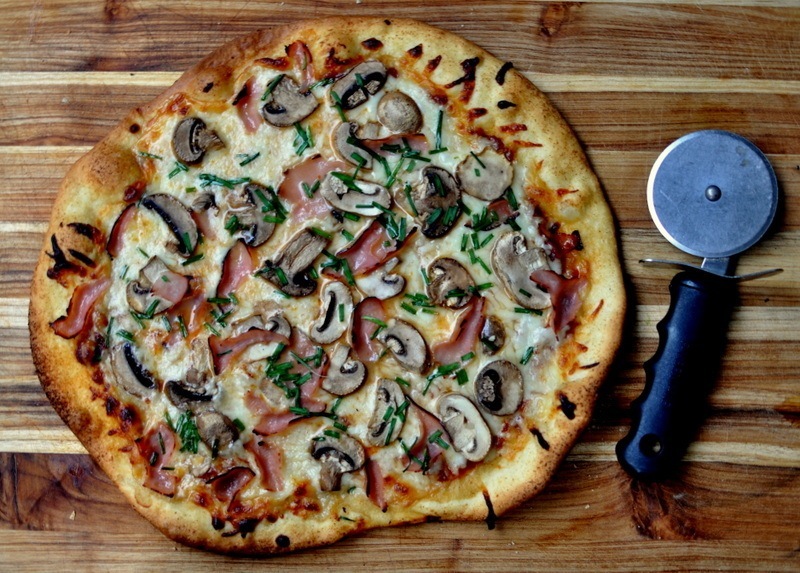 Pizza is my answer for a quick, homemade dinner. Quick pizza is a relative concept, of course. Truly speedy pizza is what you order by phone or online, the kind that arrives at the door 30 minutes after ordering, or a pie that’s hot and bubbly 20 minutes from freezer to oven. 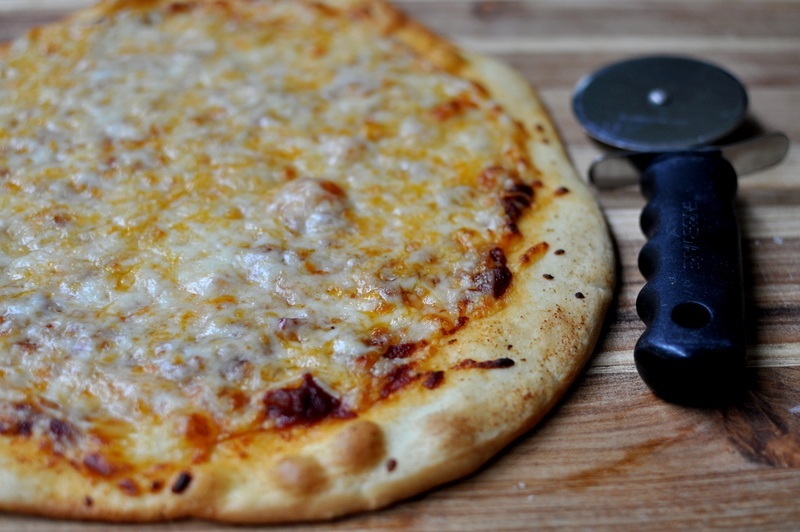 This recipe still requires a few hours lead time, but it makes for the quickest, tastiest, thin pizza crust I’ve discovered, and I’ve made my fair share of pizza over the years. * Less is more when it comes to tomato sauce, especially if you’re feeding kids. One of my first mistakes when I began making pizza was adding too much sauce. Just a light coating will do. * Brush the outer crust (ring) with an olive oil-garlic powder mixture; it adds a depth of flavor. * Toss all vegetables in a tablespoon of olive oil prior to adding to the pizza to encourage even cooking. * Add more toppings than you think you’ll need; they’ll shrivel in the oven. * Invest in a baking stone (sometimes called a pizza stone), which is inexpensive and can often be found in the kitchen equipment section of your grocery store. A stone is imperative for this recipe. The recipe yields three, thin-crust pizzas. 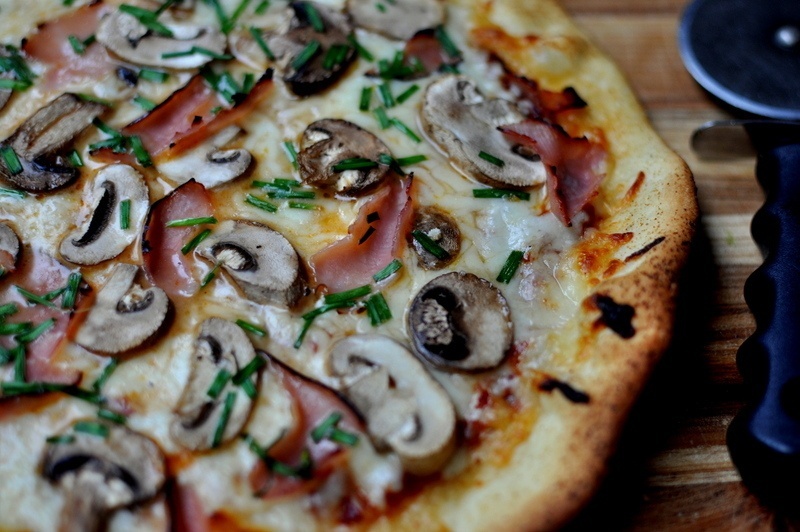 I usually make two kid-friendly pizzas and one with more adventurous toppings for the adults. This version does not require letting the dough rest in the refrigerator overnight, which is encouraged in many recipes in order to help develop flavor. I get that, I do, and I actually have another pizza dough recipe I plan to share in the coming months that requires overnight resting and yields a thick-crust pizza. But I also appreciate the option of deciding the day of, even a couple hours before dinner, to make pizza, and a delicious one at that. Below you'll find instructions for preparing the dough in a stand mixer and by hand. STAND MIXER INSTRUCTIONS: In the bowl of a stand mixer fitted with the dough hook attachment, combine the yeast, sugar and water. Let sit 5 minutes or until frothy and bubbly. Add 1 tablespoon of oil and 1 cup of flour. Knead on low for 30 seconds. Add 2 tablespoons of olive oil, 1 cup of flour and 1 tablespoon salt. Knead on low for 30 seconds. Add the final cup of flour and knead on medium-low until the dough pulls away from the sides of the bowl and becomes smooth and elastic, approximately 4-5 minutes. Transfer dough to a lightly oiled bowl. Cover with plastic wrap and let rise in a warm place for an hour. While the dough is rising, place a baking stone in the center of the oven and preheat oven to 500 degrees. In a small bowl, whisk 3 tablespoons olive oil, 1 teaspoon garlic powder and ½ teaspoon salt together. Set aside. When the dough is ready, punch it down lightly with your fist and transfer to a floured surface area. Divide the dough into three balls. Leave one dough ball on the floured surface and wrap the remaining two balls in plastic or cover loosely with a kitchen towel and set aside. Let the dough rest for five minutes. Roll the dough into a 12-inch circle. Transfer the dough to a pizza paddle or place it on a 13-inch square piece of parchment paper (not to be confused with wax paper). Whisk the garlic powder-oil mixture again lightly, then brush 1 1/2 inches of the outer dough ring with the mixture. 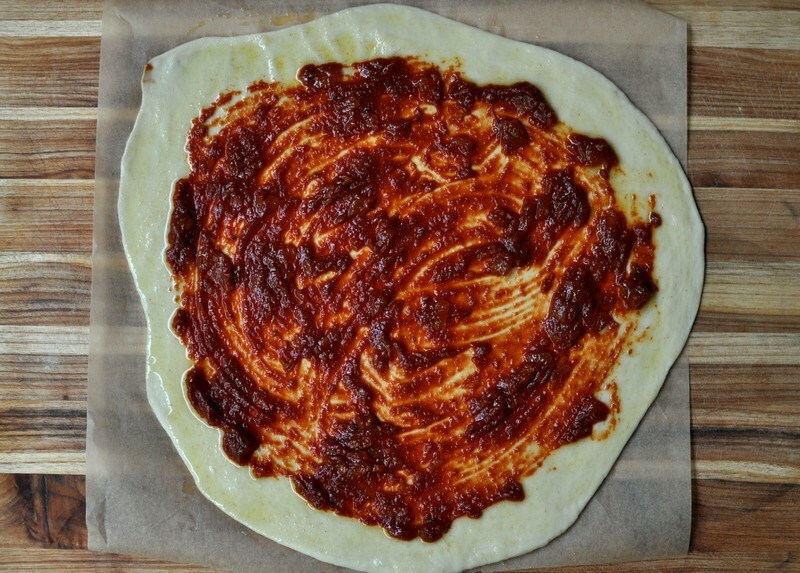 Spread 1/3 cup of tomato sauce over the inner circle of the pizza, avoiding the garlic-oil brushed outer ring. Top with 2 cups of mozzarella cheese. Add topping of your choice. If you’re adding vegetables, toss them with a tablespoon of olive oil before adding to the pizza. Slide the pizza off the pizza paddle onto the baking stone. 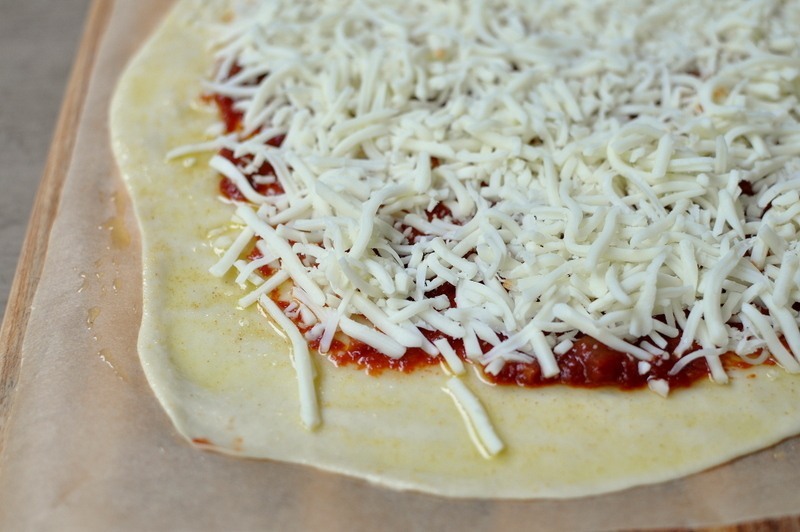 If using parchment paper, slide the pizza and parchment paper directly onto the stone (removing the parchment two minutes after baking; it should slide out easily from under the pizza). Bake the pizza for 5 minutes. Rotate 180 degrees. Bake for an additional 5 minutes. Let cool for 5 minutes before cutting. Repeat with remaining pizza dough. INSTRUCTIONS BY HAND: In a large bowl, combine the yeast, sugar and water. Let sit 5 minutes or until frothy and bubbly. Stir in 1 tablespoon of oil and 1 cup of flour. Stir in 2 tablespoons of olive oil, 1 cup of flour and 1 tablespoon of salt. Add the final cup of flour. At this point you will want to start kneading the dough until it comes together. Transfer to a floured cutting board or surface, and need for approximately 7-8 minutes or until the dough is smooth and elastic. Transfer dough to a lightly oiled bowl. Cover with plastic wrap and let rise in a warm place for an hour.